The recommendations of the Port Future Study Consensus Working Group, completed in July 2016, were presented to the Planning Committee today. The committee decided to continue investigations by scoping a process for investigating alternative port locations and for identifying and monitoring constraints and triggers to inform any future relocation. The process would include engagement and advocacy to central government to investigate an Upper North Island Port Strategy. 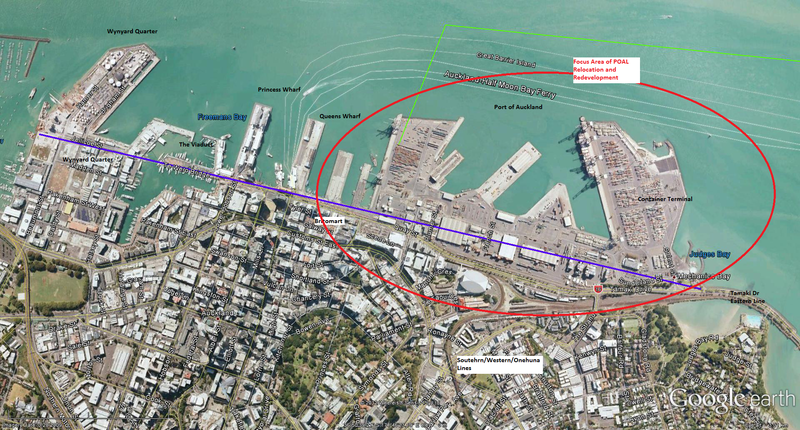 The Port Future Study was as an independent study with the objective of making recommendations to Auckland Council for a long-term strategy to accommodate Auckland’s demand for sea-based freight and cruise. The Consensus Working Group recommendations were received by the then Auckland Development Committee in July 2016 and referred to the incoming council. TheConsensus Working Group recommendations are available in the Planning Committee agenda here. With recent work completed on a Central Wharves Strategy, staged delivery of additional waterfront public space and new ferry infrastructure, considering the Port Future Study now is the next step in a review of the City Centre and Waterfront areas. Planning Committee Chair, Councillor Chris Darby, spoke about the urgent need for the council to progress this work now. “The Port Future Study was made up of 17 self-selected members from a diverse group of Mana whenua, community and business members informed by expert technical advice from a range of leading consultants. “Today’s decision holds faith with the considered and thorough work completed by that broad family of people and now it’s entirely Auckland’s responsibility to progress further work. “The lead in timeframe to make changes on large infrastructure is enormous. We need to start this work now so we can look out for future generations and for the social well-being of all Aucklanders who will be living in this city”, says Councillor Darby. The following is a digest of other decisions made at today’s meeting. The agenda is available on Auckland Council’s website and minutes will be added once confirmed. This meeting was also webcast on the council’s website and items are available on demand. Items 1-8 were administrative and input items (excluding public and local board input items covered below). Item 15 covers information memos and briefings, which are available online. Consequences on the Southern Line and the Southern Auckland industrial complexes such as Wiri and the Airport that employ thousands of Aucklanders especially from the South. I remind Councillors of this next time they discuss the Port. Mr Paul Minett spoke to the Planning Committee about his ideas for a ‘reverse tolls’ pilot project in Auckland. The presentation was referred to the Smarter Transport Pricing Project Steering Group for its consideration. Dr Mels Barton, Board member and Secretary of The Tree Council, addressed the Committee on the protection of notable trees. A report was requested to the Planning Committee by February 2018 on regulatory and other options currently used and/or available to the council to protect trees. Shane Vuletich, Julie Stout and Michael Goldwater spoke to the Committee on the Port Future Study and on next steps in the process. The purpose of the report was for the Committee to receive the Consensus Working Group recommendations and to direct Auckland Council staff to scope what the processes for location identification and for the monitoring triggers would look like. Cr Darby noted that, based on the evidence in the Consensus Working Group report, the writing is on the wall for port relocation but there is further work to do. “We do need to go to the government and advocate for an Upper North Island Port strategy. “But we also have to address this from today so the decision is about taking it to the next stage, which will not include where the port will go and timing. There is a lot more work to be done before we reach those decisions,” says Councillor Darby. a scope for identifying and monitoring port constraints/triggers on an ongoing basis to inform the execution of a relocation option, based on the matters included in the Consensus Working Group and consultants’ reports and recognising that commercial propositions, and or constraints/triggers monitoring, may give rise to a port relocation. This work will be reported back to the Planning Committee for further decision-making on next steps. Feedback from local boards on draft Auckland Plan content was received and considered by the Committee. This feedback will inform the final draft of the refreshed Auckland Plan. Widespread consultation on the final draft plan will commence on 28 February 2018 following Governing Body approval in December 2017. The Committee agreed to make operative the parts of the Auckland Unitary Plan that are no longer under appeal. The vast majority of appeals lodged against Auckland Council’s decisions on the Proposed Auckland Unitary Plan have now been resolved. Of the total 108 appeals filed only 38 currently remain active – 10 High Court and 28 Environment Court appeals. In addition there are three applications for judicial review remaining from an original eight applications filed. The draft Hobsonville Corridor Plan Change was approved for feedback from the public from Monday 6 November to Monday 20 November. The draft plan change adds a new sub-precinct to the existing precinct in the Auckland Unitary Plan and a transport plan for the new sub-precinct. Changes include improving land use outcomes by providing road connections in the new sub-precinct as well as design criteria for buildings located along Hobsonville Road. Once public feedback has been considered the final Hobsonville Corridor Plan Change will be reported back to the Planning Committee for a decision to publicly notify the plan change for submissions and a hearing. Auckland International Airport Limited has lodged two Notices of Requirement regarding changes to both the length and location of a second runway and relocation of the existing runway (Designation 1100) and for various technical and safety requirements (Designation 1102) including Runway End Protection Areas and Obstacle Limitation Surfaces. Auckland Council is obliged by law to comply with Auckland Airport’s request to publically notify both Notices of Requirement. Auckland Airport has filed an application with the Environment Court to waive the requirement for the council to directly serve notice on approximately all 266,649 owners and occupiers of land within Designation 1102 only (not for Designation 1100). However, the council will still publically notify the Notices of Requirement and will determine who is adversely affected owners and occupiers of land and notify them directly. The council is required to inform the Court of its position in respect of the waiver application with the Committee deciding to adopt a neutral position on Auckland International Airport Limited’s application to the Environment Court. The council’s decision on the direct service of notice on adversely affected persons is delegated to a group comprising Councillor Alf Filipaina as chair, local board members on the Airport Noise Community Consultative Group and Independent Māori Statutory Board member Liane Ngamane. The Committee received an update on numbers of relative affordable and retained affordable dwellings consented under the Housing Accord and Special Housing Areas Act 2013. The update was provided in response to questions raised at the August meeting of the Planning Committee. The Committee requested that the Mayor’s Housing Taskforce Steering Group prioritise investigating its recommendation to ‘investigate other mechanisms to enable new tenure and ownership models that can fill gaps between social housing and market-rate housing…[and] identify weather and how these are feasible to implement to address affordability issues”, and for staff to report back to the Planning Committee in the first half of 2018 regarding the Steering Group’s findings, for example, the possibility of a Unitary Plan change to accommodate affordability.